Hello and welcome to my site, this post will cover the basics of Japanese handsaws, known as Nokogiri, and their uses. Handsaws are a mainstay of carpentry, joinery and furniture making and remain relevant even in a time where many are using machines for a great deal of sawing work. Handsaws offer the wonderful ability to immediately adjust to the work, utilizing nothing more than the craftsman’s ability and a knife, ink or pencil line as a reference for cutting. As with my other guides, please consider this a layman’s guide of practical information rather than a definitive guide. Nokogiri can be broken up into two quality groups, those which are handmade and those which are machine made with replaceable blades. Handmade saws are produced by individual blacksmiths, much like nomi or kanna, a few of whom completely specialize in saws and others who make saws in additional to other blacksmithing work. Replaceable-blade saws typically feature pulse hardened teeth and run the range from coarse pruning saws through to saws for very fine work. Nokogiri are made to cut on the pull stroke, they offer two typical types of tooth profiles and a few more unusual profiles, such as raker tooth patterns and combination tooth patterns. Ryoba are very common carpentry saws, they have teeth on both sides of the blade. Typically one side is crosscut and one side is rip cut. The pitch will vary from the starting edge of the saw growing toward the end of the saw (saw cuts more aggressively at the end of the stroke). Ryoba are a direct substitute for western panel saws. Ryoba are typically available in a range of sizes from 180mm to 295mm. The smaller side of the range is typically used for detail and furniture work, where the larger sizes are typically used in heavy ripping or carpentry work. I find the 240mm to be my go-to tenon saw and the 195mm to be my go-to dovetail saw. These saws are replaceable blade saws by Mitsukawa. Dozuki Saws feature a steel support along the spine of the saw. This support helps the blade to act stiffer. Traditionally I believe the dozuki to be limited to crosscut profiles, however it has expanded into rip profiles and combination tooth profiles (miter saws). These saws are a substitute for western carcass saws, which also were traditionally limited to crosscutting. I use these saws for crosscutting tenon shoulders, cutting miters, occasionally very fine dovetails and also the half-lap joinery found in kumiko along with many other similar uses. These saws typically range in size from 150mm to 270mm. Kataba are single sided saws. These saws cover a huge range of uses and are similar in purpose to western panel saws, possibly more-so than ryoba. 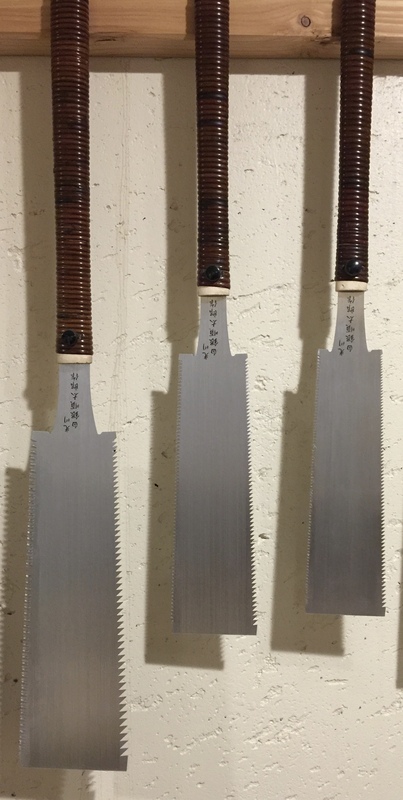 Kataba are often preferred to ryoba as often one side of a ryoba will wear out and require sharpening sooner than the other. Still, kataba are less common in the west. The kataba shown here is one of very few that I own, it is known as anabiki nokogiri. The anabiki features a curved tooth line and is typically used for fast coarse work. The sawn shown is made by Kintaro Soun. The flush cut saw, or kugihiki is used to trim dowels and other protruding wood to a flush surface. It requires careful handling but can produce and extremely fine, near surface level cut. I usually clean up the cut with very light paring work. The saw shown is a handmade saw by Mitsukawa Juntaro. The keyhole saw, or hikimawashi, is a saw used for small detail work such as cutting in small awkward areas. I often use a keyhole saw for sawing the side grooves of dai (plane bodies) even though there is a purpose built saw for that operation. This saw is made by Mitsukawa Juntaro. The Azebiki is a type of panel saw designed to allow the saw to start in the center of a panel. The saw is often used for cutting blind grooves. Azebiki are made as both kataba and ryoba. Special Thank you to Matt Connorton for information WRT Ibarame tooth patterns.